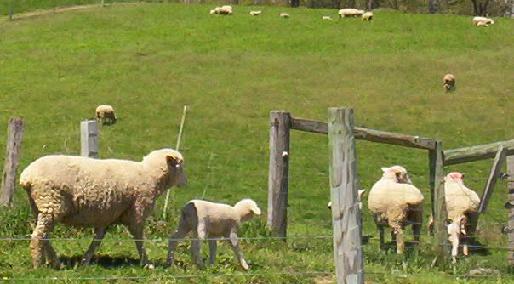 In farm country, you can't throw a stick at this time of year without hitting a newborn creature of some sort. Besides these goat kids, colt, and lambs, there have been several instances lately of coming upon calves being cleaned by their mothers right after birth. Today there were goslings following their parents into the pond, and we don't even need to talk about all the tadpoles everywhere! We've also decided that April 28th must designate "the running of the groundhogs". They were everywhere today - standing in the fields, running hither and yon, just generally acting a little crazy from the sunshine. 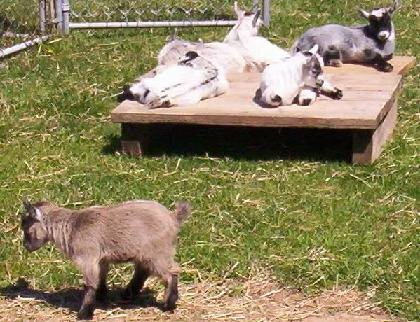 The little guys above are pygmy goats. I've never seen a skid 'o kids (is that called an anagram?) before, and there were several more of them spending time with their mothers. I have "issues" with goats, and my sister continues to try and convince me that they are sweet. 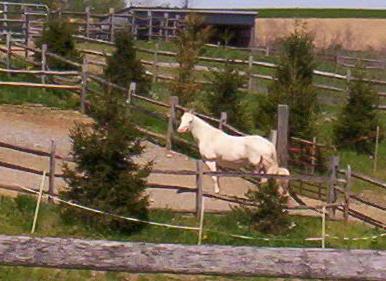 Below is the neighbor's mare and colt. She had another colt 2 years ago, and my mother watched that little one like a hawk, worrying and fretting everytime she passed and saw it lying down. Finally there were the lambs. There were so many of them! At least 50 of the sweet little lambkins kicking up their heels and running along beside their mums. One stopped to look at us, and the mother not-so-gently gave the baby a shove. This morning we set out to deliver several wholesale orders. We were headed to the side of the county that I really love. Cresting a hill, we came upon the following vista. 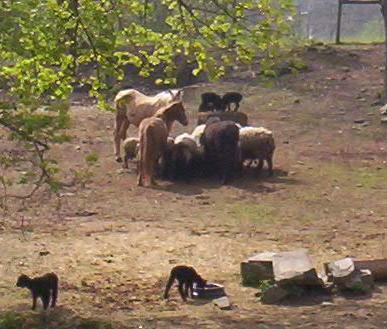 There were horses, a cow, sheep and goats all eating hay together. I thought, "what? no chickens?" Yesterday, I passed a cow with udders so full that I told her (out loud) to get herself to the barn for milking. Then, I noticed that she was licking something on the ground - a brand new, moments old baby calf. This time of year is filled with some amazing sights around these parts. During our travels we stopped at the most incredible yarn shop. There we spent a ton of money (mostly my sister). 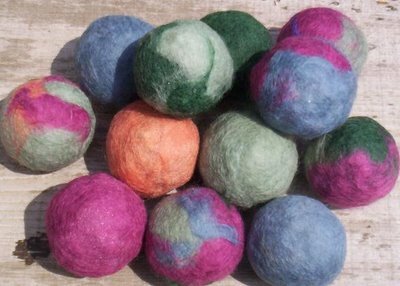 I got several "chunks" of wool to try my hand at felting. 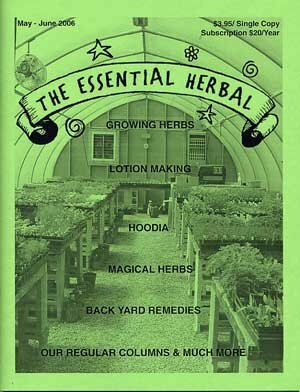 The most recent (Mar/Apr '06) issue of The Essential Herbal had instructions for felting soap. The idea is that you get a soap and wash cloth all in one. We came up with the idea of doing soap balls. In no time at all, there were a dozen of them drying in the warm spring sunshine. 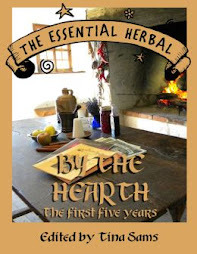 We'll see how they go at the herb festival at Landis Valley Museum next month. It was fun to do. Not practical for everyday soap, but it would be great in the right bathroom as it is very primitive looking - AND it looks great on all those soap balls we have sitting around. Everything is knocking itself out blooming around here in Lancaster County, PA. The redbuds and dogwoods are blooming, the lilacs are just beginning, and the fruit trees are stunning. My favorites are still the native woodland plants... at least this month. 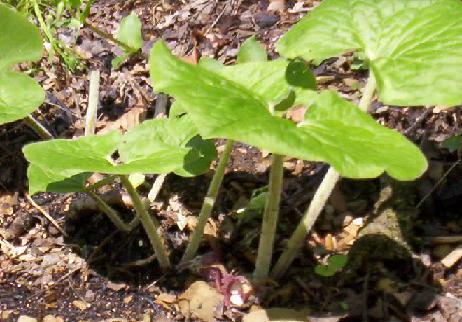 Last year, I planted some trilliums and wild ginger. Even though the weather was really ugly the past few days (rainy), it is time for them to be blooming, so I checked them today. Sure enough, they are blooming! They really are stunning. There is also a taller white trillium that is just about ready to open, and the plants are surrounded by chickweed, garlic mustard (which I keep trying to clear), false Solomon's seal, and Jack in the Pulpit. 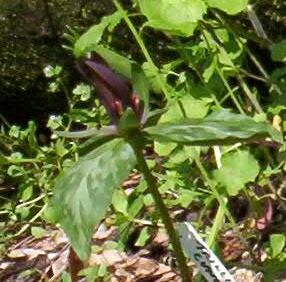 I'm trying to get information on growing Lady Slipper so that I can find an ethical source and try to grow them here too. The other day when I was in the woods, I found some trout lily (AKA dogtooth violet) blooming right in the middle of some fern fiddleheads. 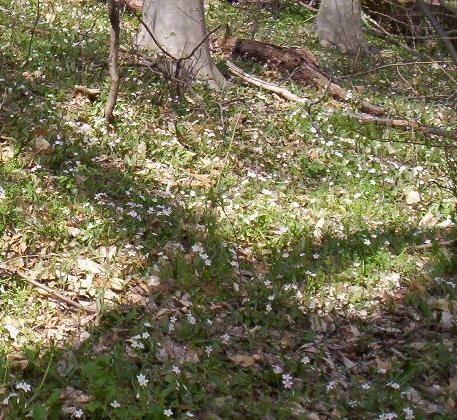 The spring beauty was scattered on the woodland floor like tiny gems, and next week they will be joined by 10's of thousands of the trout lilies along with bloodroot, mayapple, and wild geraniu m. There were also the usual crop of sweet violet in the many hues of violet, purple, blue, and a blu-ish red. Also white and yellow violets. 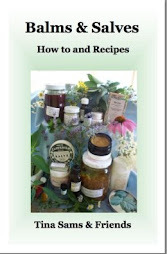 Each year we make violet syrup with the flowers. 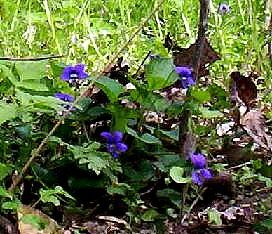 To do so, gather just the flower heads of the violets - something that children adore doing :-). When you have a quart or so of the flowers, rinse them well and place in a pan with approximately one quart of water. Bring to a gentle boil, then turn off heat and steep for about 15 minutes. Strain out the flowers. Add 2 to 3 cups of sugar and 1 tsp. lemon extract and stir until sugar is dissolved. Bring this mixture to a boil and cook for 3 minutes, skimming off any foam that may form. When it cools a bit, bottle the beautiful lavender to purple syrup for use on crepes, ice cream, over melon (! 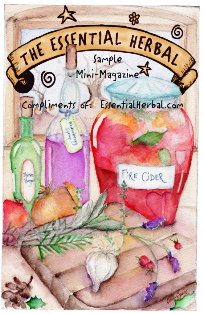 ), or to sweeten herb tea. This syrup can be made with roses, too. May/June 2006 issue is in the mail! 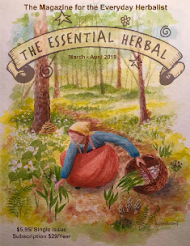 For information on subscribing, visit our website! Shenk's Ferry, etc. 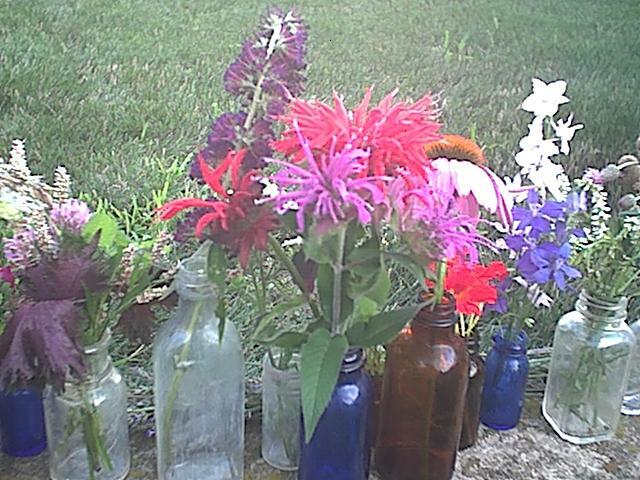 Wild Flowers - YAY!!! Today was the perfect spring day. It is actually almost hard for me to put into words because it was so incredible . When I was very small... maybe 3 or 4, I remember finding a sprig or two of dutchman's breeches. Now, I believed without a shadow of a doubt that there were tiny little fairy men somewhere nearby. I wished it with all my heart, and for that moment in time, I was transported with that belief. It was complete magic. Since that time, I've never seen them in the wild again. Once, I almost did... found a couple sort of dried up sprigs, but not really growing. Until today. 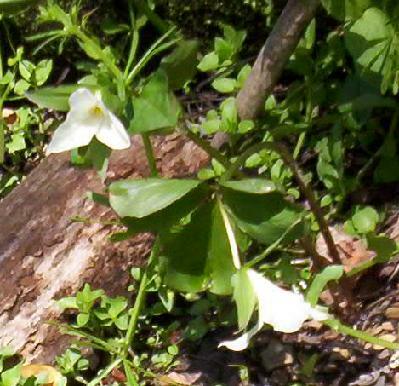 Today I saw millions of them along with trillium, corydalis. 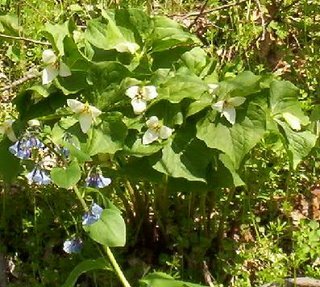 Virginia bluebells, spring beauty, grape hyacinth, violets in purple, white, and yellow, and rock cress. Oh! What a day! We went riding down along the Susquehanna river finally winding up at Shenk's Ferry Wild Flower Preserve. The road leading to the preserve was rock walls 50 feet or higher, covered with bluebells and trillium, ferns, and dutchman's breeches. At one point I turned to my sister and told her that if one of the eagles nesting nearby happened to fly over AND I would happen to see lady's slipper (still haven't seen that one....), I would be content to die on the spot. 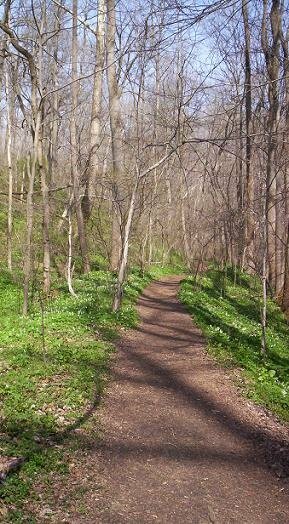 Fiddlehead ferns above, trillium and VA bluebells below. 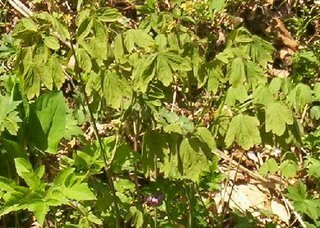 There were also large stands of blue cohosh, not yet ready to bloom, huge patches of wild geranium, daylilies, and something called squirrel corn... all just on the verge of blooming, but not yet open. 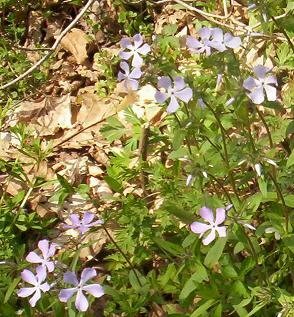 The phlox was just starting to open. The day started just a little on the shaky side. 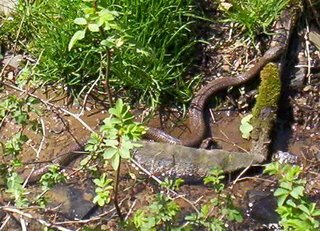 First there was the very healthy sized garter snake (2') that got away before I could get a decent picture of him, and then there was this lovely 3 or 4' water snake lazing on a log over the little creek, catching some rays. All in all it was one of my favorite days of the year so far. Use the language of flowers to speak to the world around you. Imagine if your garden could be a large tussie mussie! Wouldn't it be an interesting planting if all the concentric circles had meaning? The easiest way to make a circular garden is to begin by deciding on how large the circle will be. For this example, we'll be making a 6 foot circle. We'll need a 3 foot piece of string - with enough extra to tie, and a stake. Tie the string to the pencil, and stick it into the ground where the center will be. As you go around the circle, mark it with flour. This will be the outside of the garden. Depending on the plants you have chosen, you will want to make smaller circles, but first the garden should be built up in the center so it will resemble the little bouquet it is to be named for. Form a mound using good soil. The center could be a 1/2 barrel, too. Make a couple circles going out from the center. The center needs to be taller flowers. Roses (even miniature bushes would work if using a 1/2 barrel) or a nice tall rosemary would be nice. Add the plants in circles, concentrating on plants that will retain either their flowers or a nice foliage through the summer months. The outside edge would do well with alysum, or "Dusty Miller" artemesia to look like lace. Okay, so that was more than a few....and I restrained myself! 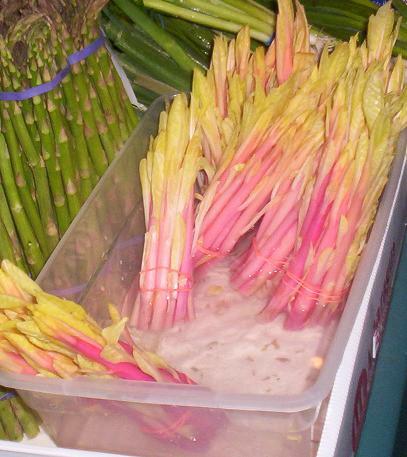 At market on Friday, one of the stands had pokeweed shoots right next to the asparagas. It never surprises me to see bags of nicely cleaned dandelion greens, but this is the first time I've seen poke. It shouldn't surprise me, since older folks around here like their wild greens, but it just wasn't there before that I can recall. Now if they carry Jerusalem Artichokes next fall, we'll be in business! 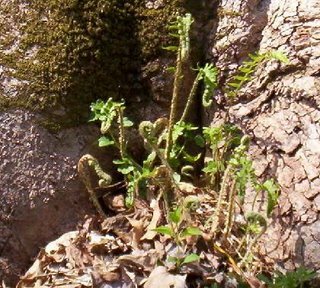 "In fact, the poke plant contains phytolaccic acid in the leaves, roots, and stalks as well as the berries; there ismore in the roots and the red outer skin of the mature stalks than in the mature leaves. 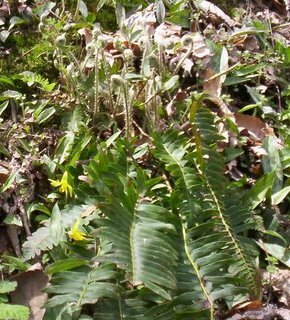 Until the flower head forms, the young shoots and the leaves are a fine pot green. The acid is easily removed from the greens by parboiling them, then cooking them in fresh water. I also prefer to parboil the young shoots. If all the colored skin is peeled off - and easy operation, as it stirps off readily - it is not necessary to parboil poke stalks. Poke is not only a widely distributed plant but a large one, so there is no shortage of green vegetables when it can be located. If you are new to foraging for poke, look for last year's stiff and broken stalks, then watch for the new young sprouts to appear at their bases. If you pick often and break back the fast-growing plant, you can assure yourself of a crop that often continues into summer. 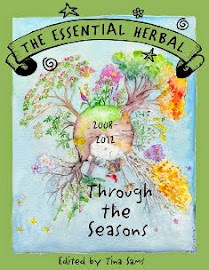 It's not unusual to have another fresh crop of sprouts in the fall, too."